Last week, we got this picture of SNCF 427044 hauling a train including two silver TGV motor cars. Nothing special maybe, as these TGV have been in production already for a long time. But there is something different with these two units. At the bottom the dark grey paint is applied in a wavy form. We are looking at motor cars for the future TGV in Morocco, on their way to Alstom’s factory in La Rochelle. 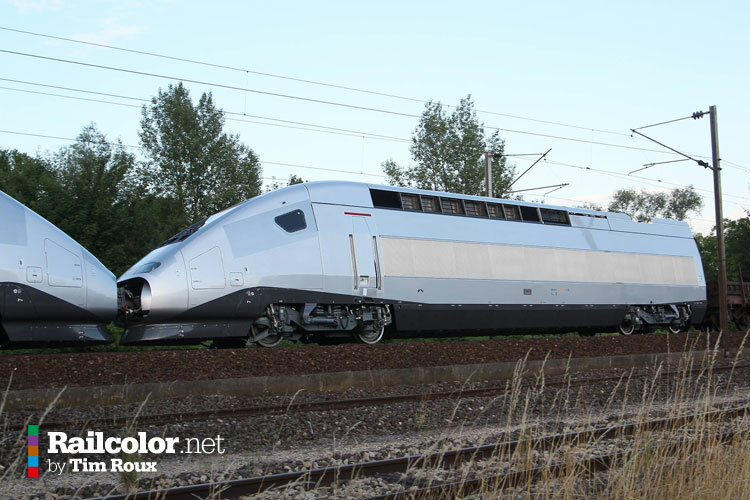 For some months now, Alstom has completed a complete trainset in a basic silver livery, with Alstom Duplex markings. It is part of the TGV 2N2 ‘Euroduplex’ generation of Alstom, that also being built for the French railways right now (series 4700 and 800).